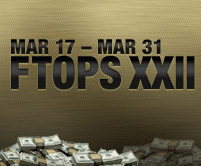 The 22nd Full Tilt Online Poker Series (FTOPS) came to a close this weekend with two huge tournaments on the schedule: The FTOPS XXII Main event as well as the final day of the FTOPS XXII High-Roller tournament that began on Sunday. Both tournaments boasted huge prize pools with the High-Roller tournament easily surpassing its $1 million guarantee and the Main Event easing past its $2 million guarantee. The FTOPS XXII saw Full Tilt Poker host 38 tournaments over the two-week tournament series, and poker players saw plenty of value with quite a few events failing to reach their guaranteed prize-pool –including the $750,000 guarantee, $240 NLHE Knockout tournament Full Tilt ran on the final day of the series. But the High Roller tournament and the main event can only be seen as major successes. The High-Roller tournament for the FTOPS XXII was a two-day event that allowed players multiple reentries, which helped produce the 776 entries, and a prize-pool of over $1.5 million. In the end it was a couple of well-known user-names in the online poker world who took the top spots (not all that strange an occurrence in a High-Roller tournament) as Kevin “-1SickDisease-” Eyster bested Sami “LarsLuzak” Kelopuro for the title. With a $600 buy-in and multiple reentries the FTOPS XXII Main Event attracted 3,653 entries, generating a total prize-pool of $2,191,800, easily eclipsing the $2 million guarantee. The winner of the tournament, a player using the screen-name “feel fine” was the eventual winner, easily besting his best ever cash according to the online poker tracking sites.